A source told the Post that Bezos is “looking for a new home now that he is single again.” The newspaper reports the billionaire was recently spotted at the Four Seasons Hotel as a guest. Bezos already owns four apartments in one building in Manhattan, as 6sqft reported last year. The chief of Amazon first picked up three units at the Century, a condo building at 25 Central Park West, in 1999 for $7.65 million. In 2012, he bought an adjacent, 1,725-square-foot condo for $5.3 million. 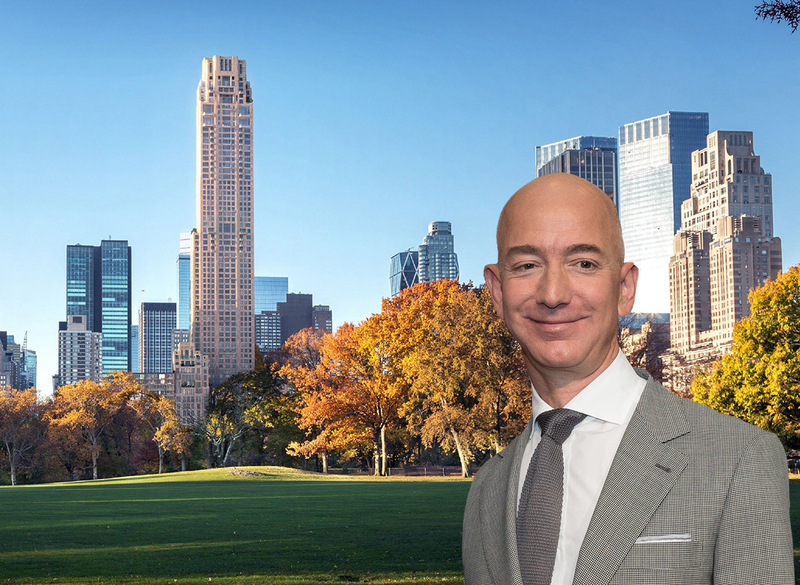 Sources told the Post that Bezos looked at full-floor units at 220 Central Park South that cost roughly $60 million. In January, billionaire Ken Griffin picked up a penthouse at the supertall for $238 million, setting the record for the most expensive home sold in the United States. Griffin said he planned to use the home as a pied-à-terre, which renewed interest in a tax on non-primary homes worth $5 million and up. But instead of a pied-à-terre tax, the state’s 2020 budget included a “mansion tax“- a one-time tax on properties valued from $1 million to $25 million or more–and an attendant transfer tax when those properties sell.